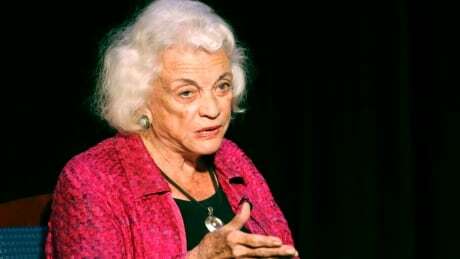 Sandra Day O'Connor, the first woman on the Supreme Court, announced Tuesday that she has the beginning stages of dementia, "probably Alzheimer's disease." The 88-year-old, who retired from the court in 2006, said in a public letter that her diagnosis was made some time ago and that as her condition has progressed, she is "no longer able to participate in public life." "While the final chapter of my life with dementia may be trying, nothing has diminished my gratitude and deep appreciation for the countless blessings in my life," she wrote. She added: "As a young cowgirl from the Arizona desert, I never could have imagined that one day I would become the first woman justice on the U.S. Supreme Court." O'Connor's announcement of her diagnosis came a day after a story by The Associated Press that she had stepped back from public life and in which her son Jay O'Connor said that his mother had begun to have challenges with her short term memory. He also said that hip issues have meant she now primarily uses a wheelchair and stays close to her home in Phoenix. O'Connor last spoke in public more than two years ago. O'Connor was a state court judge before being nominated to the Supreme Court in 1981 by President Ronald Reagan, who fulfilled a campaign promise by nominating a woman to the Supreme Court. O'Connor had graduated third in her class from Stanford Law School and was the first woman to lead the Arizona state senate. She was 51 when she was unanimously confirmed to the high court. On the Supreme Court, her votes were key in cases about abortion, affirmative action and campaign finance as well as the Bush v. Gore decision effectively settling the 2000 election in George W. Bush's favour. O'Connor was 75 when she announced her retirement from the court in 2005. She stepped down in January 2006 after Justice Samuel Alito was named to take her place. It was a decision influenced by the decline in the health of her husband, John O'Connor III, who himself had been diagnosed with Alzheimer's disease. Chief Justice John Roberts said in a statement that he was "saddened to learn" that O'Connor "faces the challenge of dementia." "Although she has announced that she is withdrawing from public life, no illness or condition can take away the inspiration she provides for those who will follow the many paths she has blazed," Roberts wrote.